20/30 ANNI, LE AUDIZIONI SONO APERTE A TUTTE LE ETNIE CON ENFASI E PREDILEZIONE PER BALLERINI/PERFORMER DI COLORE. 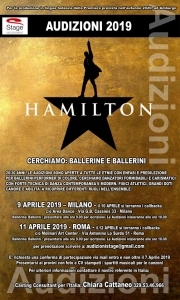 CERCHIAMO DANZATORI FORMIDABILI E CARISMATICI CON FORTE TECNICA DI DANZA CONTEMPORANEA E MODERN. FISICI ATLETICI, GRANDI DOTI CANORE E ABILITA’ A RICOPRIRE DIFFERENTI RUOLI NELL’ENSEMBLE.